deserted as the Italian Armistice was announced on 8 September 1943. The camp was reorganised by the Germans, became a transit camp and was completely evacuated in January 1944 ahead of the Allied advance. 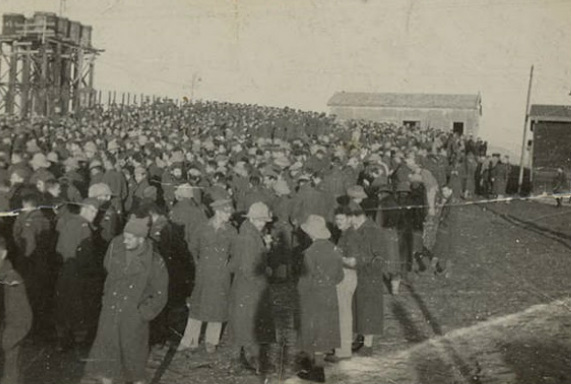 The 1,100 British, South African and American prisoners of war were put on a train to be taken to a camp in Germany. On January 28, 1944, they were crossing the Orvieto Railway Bridge North in Allerona, Umbria, when the American 320th Bombardment Group arrived to bomb the bridge. Unaware that there were Allied prisoners on the train, they dropped their bombs on their targets. The Germans left the prisoners locked in the waggons and fled. Approximately half the men were killed by the bombs, or when the cars ultimately tumbled into the river below. thanks to Chris Kemp and his truly excellent website, in memory of his grandfather and the other POWs at this camp.